The observatory foundation posts being buried. A 10" diameter concrete pier had been poured there many years earlier before the pine trees had been planted. The observatory was designed around the pier with added space for another telescope. All the holes for the foundation posts were dug with a post-hole digger. 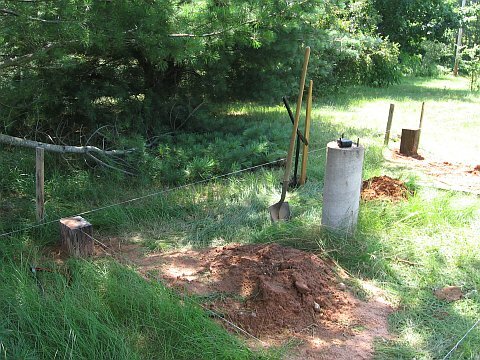 Six posts were set about 3-1/2 feet deep and spaced so that the 8 ft x 18 ft frame would sit on the posts for support. A platform for the second telescope was built with its own foundation so that it was independent of the observatory floor. Four 1/2 railroad ties were buried to support it. Jumping on the floor has no effect on views through the telescope. 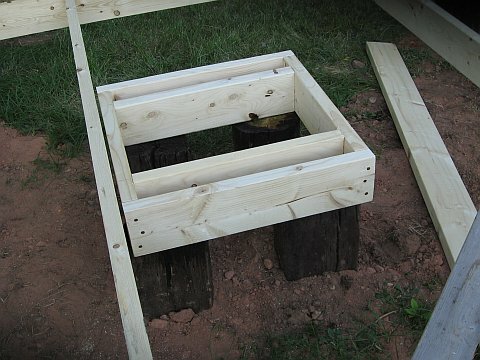 The 4 ft section of a railroad tie had to be buried at just the right depth so the 2x6 framing for the floor would be level. 2x6's floor joists were spaced 2 ft apart with additional blocking at half the span. 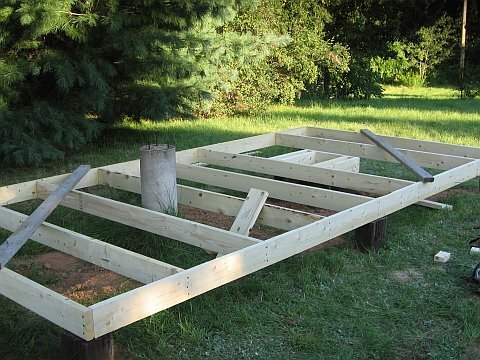 No joists were cut but spaced so the pier and platform were located between joists. 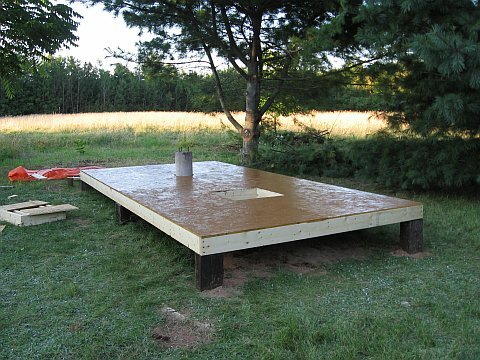 The finished floor with the second telescope platform not in place yet. The flooring was 1/2" chip board with two coats of deck stain. It was tempting to stop here and just use this as an observing deck. [That would have required covers over the telescopes] I kept working and made a roll-off roof observatory. I am glad I did because now more than just the telescopes can be put here to make for convenient, more comfortable observing. The observatory walls are 4 ft high with one door on the south end (shown). 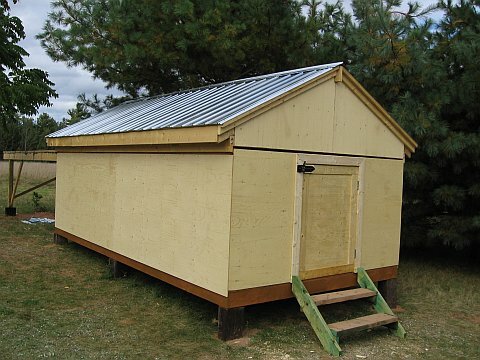 The design conserves sheathing by using whole sheets for the floor and the siding. There is not much load on the walls so 2 ft spacing of the studs was used. The rails on which the roof rolls are the sills of the east and west walls. 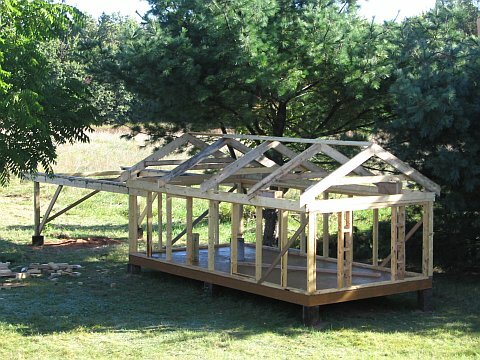 Outside to the north 2x4s supported by 2x6 provide a place to move the roof. A separate, cross brased structure was built for supporting the external rails. 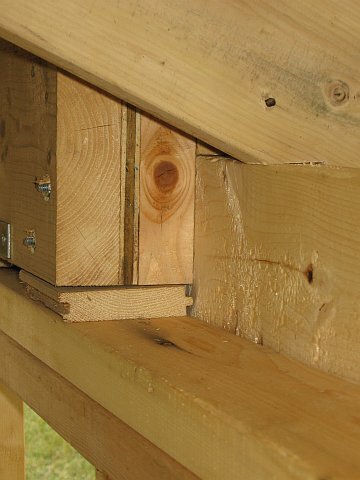 The 2x6 support for the external rail was tied into the wall by running it across two studs and nailing it in place. This view is from inside the observatory looking north and a little west. 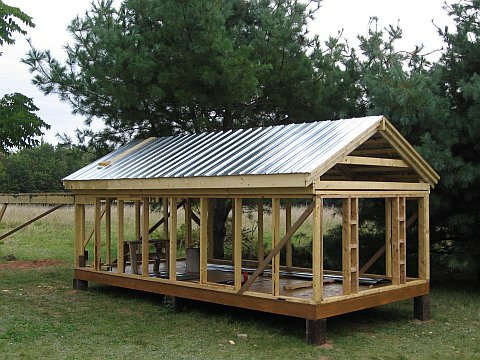 The roof was designed to be sturdy but as light as possible. 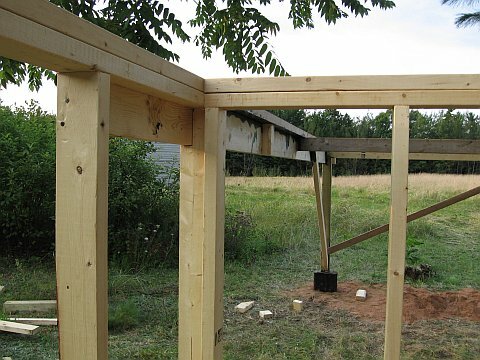 1x4 purlins were used across trusses spaces 4 ft apart. 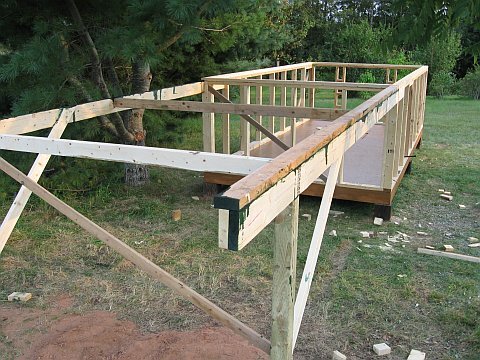 Rafters were 2x6s cross braced with 2x4 a foot above the sill height. 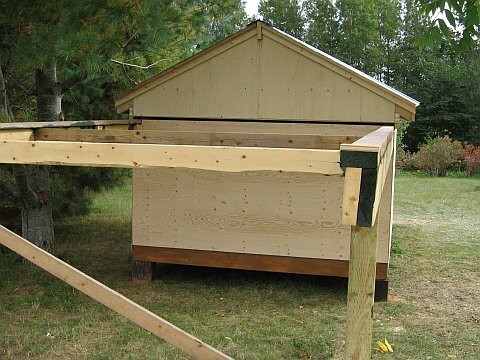 The roll-off roof has four wheels attached to the 2x6 supports of the roof rafters. A box was made to hold each of 8 inch diameter and 1-3/4 inch wide wheels. These were bolted and lag screwed to the 16 foot long 2x6 that made the side roof support. 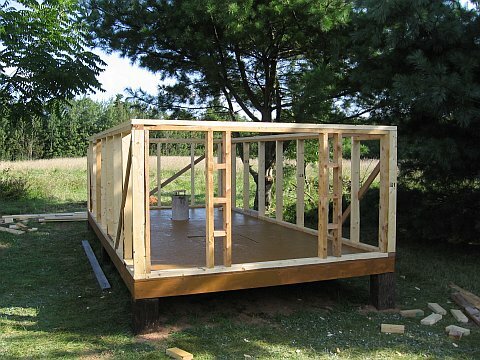 The 2x6s were spaced just 1/2 inch wider than the building and hung 1-1/2 inch lower than the walls. 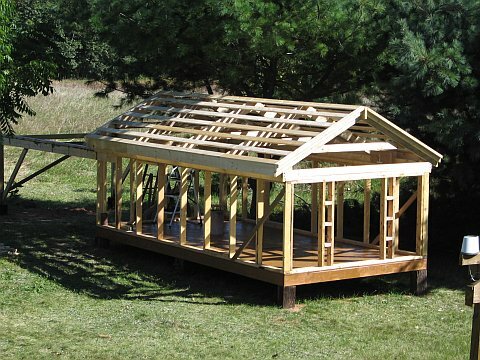 These overhangs guide the roof as it rolls and keeps the roof on the rails. 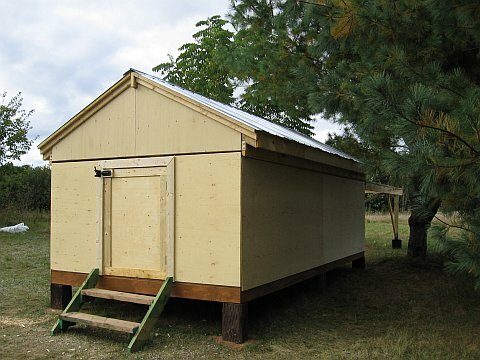 The spacing was maintained by the roof rafters and end 2x4s. The roof was built before the wheels were put in place so that the roof would not move during construction. Before the roofing was screwed in place, the wheels were put in their boxes and the roof jacked up to rested on blocks (and to take the weight off the wheels). This image shows the purlins in place ready for metal roofing. This is a wheel box with its wheel in place. The box is block up with two pieces of boards. Note the steel bracket on the side to reinforce the wood where the 1/2 inch steel axle bolt passes through the wood. The box is 7 inches high and since the wheel is centered in the box, only a 1/2 inch of wheel is below the bottom of the box. 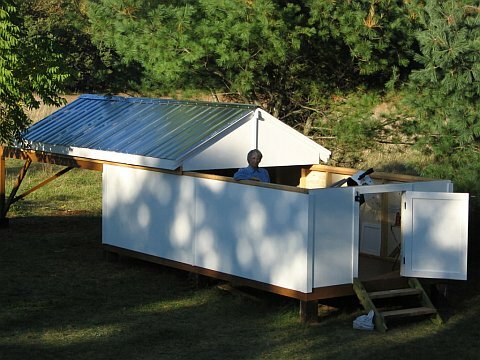 The observatory with metal roofing in place. Each slope was a little over five feet in length and sinc roofing only comes in 8, 10 , 12 lengths, each piece had to be cut from a 12 foot length. Edging was attached before the roofing began. This picture and the next shows a problem that should have been anticipated. 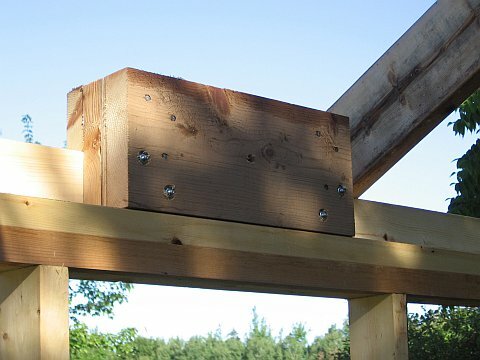 The wheel boxes are on the inside of the 2x6 support and the rafters sit on the support. This geometry produces a torque from the roof load that twists it and the wheel box. Equal weight is needed on both sides of the wheel box to keep it from twisting. This photo from the outside at the south end shows the twist in the 2x6 support due to the roof weight. 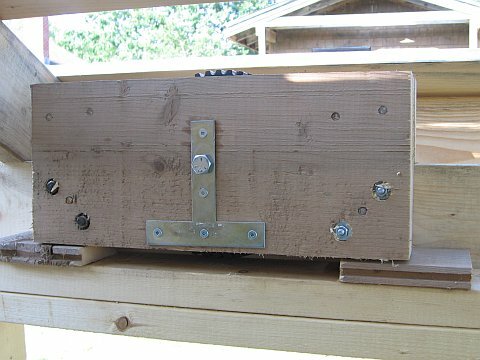 The problem was solved by adding another support beam to the roof on the inside of the wheel box such that it also supports the weight of the roof. 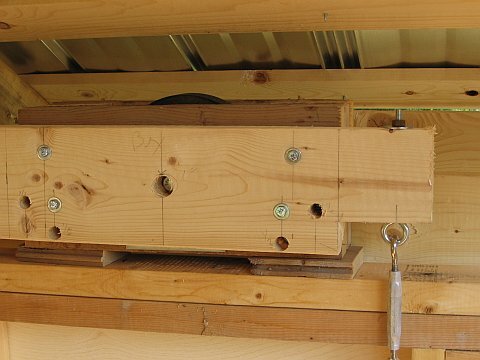 Two 2x6's were added under the rafters and attached to the wheel boxes. This required drilling holes in the new supports to allow access to the axle bolts. An unseen benefit of these additional supports on the inside was that there is now a convenient place to attach turnbuckles for roof tie downs. 15a. This diagram shows a cross section of the support of the roof rafter. Two wheel boxes on each side are spaced 10 ft apart. Here the observatory is all closed in, including its 4 ft high by 32 inch wide door. One has to be careful climbing into the observatory since the head clearance is very low. The fact that the rafters are spaced 4 feet apart is a bonus since one can stand in the space between. The clearance from the floor of the cross supports on the rafters is 5 feet so short persons can carefully walk in the observatory by tilting their head. (However, it is easy to forget and get bonked frequently). Another view of the closed-in observatory from the north end. 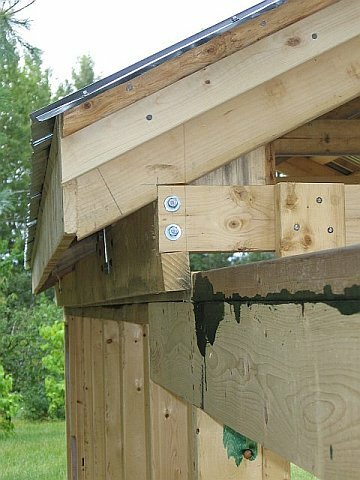 Cross braces are required between the rails to hold them the correct distance apart for the roof. At the moment a white pine has branches hanging the observatory and these need to be cut back. The fact that there are two white pines to the east of the observatory is not a complete disadvantage. The city of Kentville is to my east and the skies there are always bright. Lights of cars coming down the road from the east are blocked by these trees. I will cut the over hanging limbs to open up the north-east sky. A view of the observatory, painted, with the roof rolled half-way off, and a person to show scale. The observatory was used for the first time Sep 25, 2006. "I Wish I had built it 20 years ago."